This isn’t just a seminal album. It is an estuary. All the black rivers that would form Brazilian funk/hip-hop flow through it. Led by Paulista pianist Salvador Silva Filho – Dom Salvador – Som, Sangue, e Raça from 1971, one year after the explosion of Tim Maia on the scene, catalyzed the bossa nova and jazz background of its leader with the rhythm and blues of its members like saxophonist Oberdã Magalhães, nephew of samba-enredo master Silas de Oliveira and future leader of Banda Black Rio, who since the group Impacto 8 had already been trying to reconcile MPB with Stevie Wonder and James Brown. Add to all this a mixture of samba, Nordestino accent, and even the black side of the Jovem Guarda represented by the authorial presence of Getúlio Cortes in Hei! Você. Alongside these elements and the presence of Rubão Sabino (bass), who still called himself ‘Rubens’, drummer Luis Carlos (another member of Black Rio), the record enlists the trumpet and flugelhorn of symphonic musician Darcy in place of the original Barrosinho (yet one more founder of Black Rio), who was traveling during the recording but would end up being a leading force of the band. 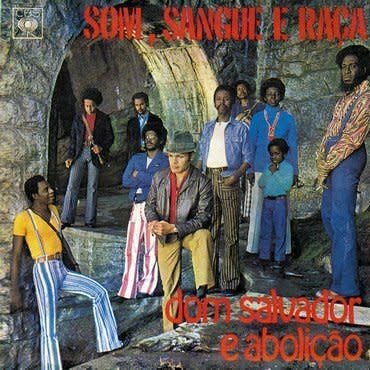 The album Som, Sangue e raça paves the way for future generations of musicians and producers of the Carioca scene at the beginning of the 1970s. The lyrics that dealt with the question of race and the explosive fusion of samba, soul, jazz, and funk, elaborated by Dom Salvador and his troupe, Abolição, established the bases for the development of new sounds and tendencies in Brazilian music.